Heinrich Karl Bukowski - better known as Charles Bukowski (or "Hank," to his friends and family) - was born in Andernach, Germany on the 16th of August, 1920. When he was a lad of three, his parents moved their family to America. Living in South Central Los Angeles, Bukowski had a difficult childhood. His anguish was made worse by a very severe case of acne. 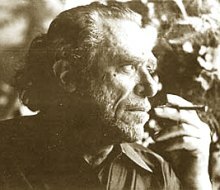 When he became a writer, Bukowski focused on the tough parts of life. Beyond the drudgery of work, he wrote about the lives of ordinary Americans - and about his own. Few wrinkles were left out. Not since Orwell has the condition of being down and out been so well recorded in the first person. In the third edition of The Norton Anthology of Modern and Contemporary Poetry, in which poets appear in order of birth, the class of 1920 fields a strong team, including Howard Nemerov and Amy Clampitt. If you were to browse the poetry section of any large bookstore, you would probably find a book or two by each of those critically esteemed, prize-winning poets. Nowhere to be found in the canonizing Norton anthology, however, is the man who occupies the most shelf space of any American poet: Charles Bukowski. That's because Bukowski didn't use the types of words, or focus on the types of topics, that distinguish poets like Yeats or Browning or Byron. He wrote - sometimes pretty grumpily - about things which bothered him. And ... he didn't mince words when he was upset about something. Not everyone agrees with Bukowski's observations expressed in his books and poems. Before he died of leukemia, in 1994, he had a loyal following. With the advent of the Internet, however, his popularity has grown. In this poem - "so you want to be a writer?" - he tells us what he thinks about his profession. As you hear Carole Bos (the creator of Awesome Stories) read Bukowski's words, think about these points. ISSUES AND QUESTIONS TO PONDER: Bukowski has very strong opinions on what it takes to be a writer. He makes it sound as if good writing only happens to gifted people through bursts of inspiration. Is that true, or not true? Why, or why not? Famous writers sometimes relate their own stories about the difficult task of writing well. If such individuals had applied Bukowski's reasoning, to their own lives, would they have ever become writers? J.K. Rowling has described how long it took her to write the Harry Potter series. Had she applied Bukowski's approach to writing, would the rest of the world have ever been introduced to Hogwarts? Does it have to be a person's destiny, to become a writer? If not, why would Bukowski imply that? If a person struggles, to come up with the best-possible writing - then produces highly respected work - would the author of this poem call that individual a "writer?" Do you think this poem might have come about when the poet, himself, had a difficult day in which he struggled to create what he wanted to produce? In other words, might the tone of this poem be one of personal frustration instead of professional advice? Why, or why not? "so you want to be a writer?" - by Charles Bukowski - copyright, Charles Bukowski, all rights reserved. Provided here as fair use for educational purposes, and read by Carole Bos (creator of Awesome Stories). Bos, Carole "So You Want to be a Writer, by Charles Bukowski" AwesomeStories.com. Oct 07, 2013. Apr 20, 2019.